Senior forward Nick Jeworowski rises above two Kelseyville defenders as he shoots a layup in St. Helena's 58-43 win over the Knights. Junior forward Caleb Jeske fghts to get past a Kelseyville defender in St. Helena's 58-43 win over the Knights. Behind Nick Jeworowski's career-high 27 points, St. Helena High's varsity boys basketball team defeated visiting Kelseyville High 58-43 Wednesday night. The Saints improved to 7-4 in the North Central League I and at the very least assured themselves a .500 league record and postseason consideration. Saints head coach Jim Gamble acknowledged his team had a sluggish first quarter, which ended with the teams tied 11-11. "The kids came out and truthfully, at the beginning of the game, we didn't have any energy, which is unlike us," he said. "And then I put the second (unit) in and they really picked us up. They had good energy, and they scored a couple buckets right there at the end of the (first) quarter to keep the game close going into the second quarter." Jeworowski scored 16 of the Saints' 20 points in the second quarter as they closed the period with a 15-3 spurt to build a 31-19 lead at halftime. 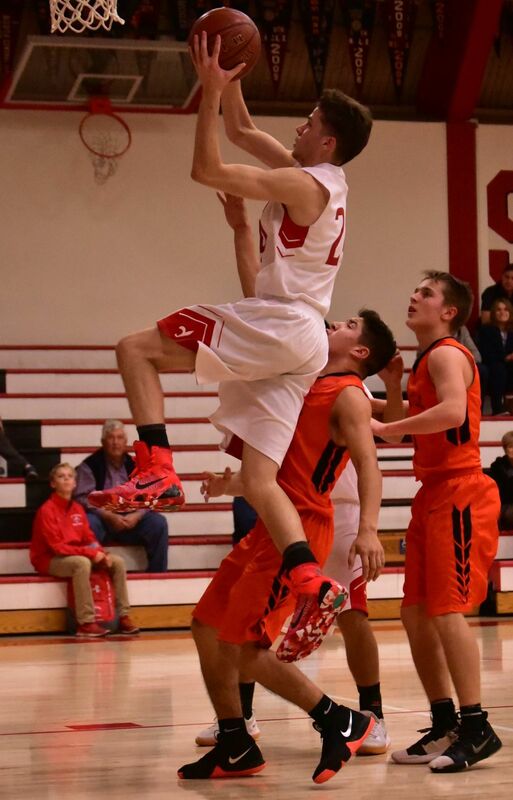 Besides Jeworowski, Gamble also praised Caleb Jeske, who scored six points Wednesday night. Jeske's spirited and physical play in the paint often served as a catalyst for the entire team. "Caleb Jeske is the strongest kid on our team," Gamble said. "He's super physical and he has real presence in the middle, which we need because we're not a big strong team, so he does a tremendous job for us in the middle of the paint." The Saints appeared to be in control of the contest entering the third quarter. But behind Bodhi Baird, who scored a team-high 14 points, the Knights closed the gap to 43-37 entering the fourth quarter. 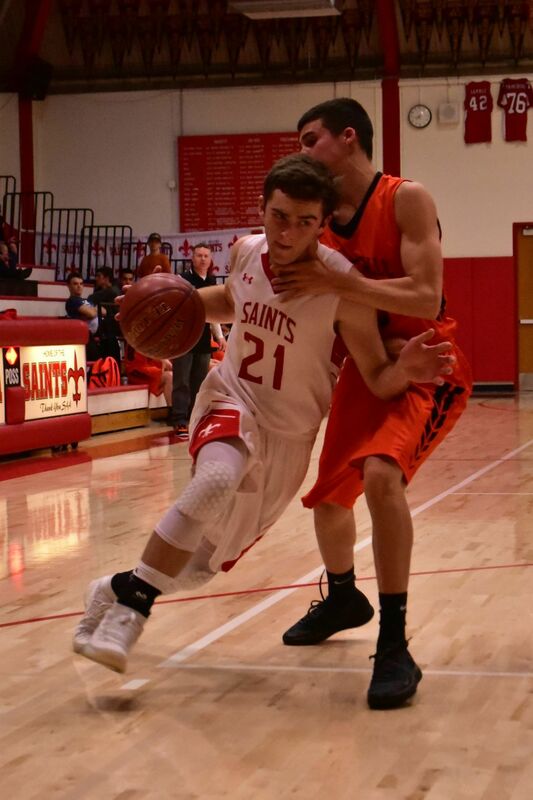 But the Saints, led by junior point guard Jonathan Gamble – who has been battling through an injury all of this week – and senior shooting guard Christian lano, countered with a 13-4 run to put the game away. lano scored six points. Fawad Muhammad, Caleb Granados and Gamble each scored five, and Wolfgang Pritchett added four. The Saints were without backup point guard Colin Darrall because of illness. Cory Holt scored a game-high 33 points Wednesday night to help lift the Knights, who outscored the Saints 22-14 in the fourth quarter. Henry Dixon led St. Helena (6-13 overall) with nine points, while George Cutting scored eight and Cal Lehman added six. Henrik Wrede and Will Peterson contributed five points apiece. Will Garrett collected four points. Tiago Bastos had three points while Robert Pryzbylinski and Ivan Robledo had two points each. All players on the Saints' active roster got playing time.